Tony Andreu's second-half penalty took Dundee United level on points with Championship leaders Hibernian, who missed a spot-kick at Tannadice. Cammy Bell pushed away a poor effort from Martin Boyle, who had been tripped by Lewis Toshney on 55 minutes. A strong run from United substitute Simon Murray was then halted by a Liam Fontaine foul. Andreu, the pick of the players in a scrappy, high-octane match, coolly slotted home. The win stretches United's unbeaten run to 11 games, while Hibs slipped to their first away defeat of the season. The first half was high on energy with play swinging from end to end, but while Hibs enjoyed more possession it was the home side who looked the sharper. On-loan Norwich City striker Andreu was the focal point for United's best moments, and it was appropriate he should eventually improve his impressive scoring record to nine goals in 13 games. Luckily for the visitors, Andreu's efforts were imaginative ones from distance in the first half and they lacked the direction to trouble Ofir Marciano until the decisive penalty. That came when Murray galloped from halfway to deep inside the Hibs box only to be barged over by Fontaine, with Andreu sending Marciano the wrong way. Boyle's pace up front carried Hibs' best hopes for a breakthrough before the interval but he lacked the confidence to exploit his best opportunity when sent clear by Mark Durnan's nervy pass-back. It was quite a night for Boyle and not one he will want to remember as a game that was always simmering exploded into action when he was upended by a stretching Toshney. Team-mate Grant Holt appeared to think he should take the penalty, reacting angrily before Boyle stepped up to hit a low and weak effort that was easily stopped. Holt's evident frustration spilled over into an incident with Willo Flood that saw both booked for a spot of wrestling and a few others lucky not to suffer the same fate. Boyle was replaced by Jason Cummings shortly afterwards, with Bell making a fine save at near post to keep out a deft touch from Andrew Shinnie. Hibs, in the absence of injured midfielders John McGinn and Fraser Fyvie, lacked composure and penetration in that key area and failed to test Bell again after falling behind on 73 minutes. 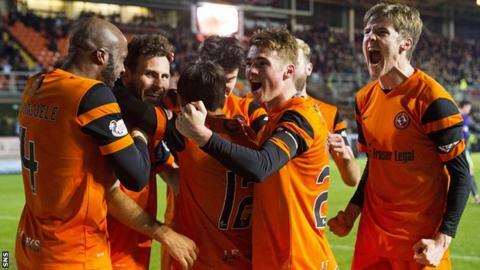 Dundee United's Ray McKinnon: "I thought the players were terrific from start to finish. It's a great three points that keeps the momentum going. "Cammy Bell has been outstanding for us. He has saved a lot of penalties already this season so we had every confidence. Fair play to Simon Murray as I never started him but he came on chased down the ball and won our winning penalty - he gave us a bit of a spark. "We were very fragmented at the start of the season but we got players like William Edjenguele and Tony Andreu in who have made a huge difference. "I always felt we would be better come the turn of the year and hopefully we can get one or two more players in when the transfer window opens to make sure we stay up at the top." Hibernian's Neil Lennon: "The result is disappointing. I didn't think we played as well as could first half but I thought we were very good second half and the game hinged on two moments. "If we score our penalty, we go on to win the game as we defended pretty well. "Martin was always the designated penalty-taker. Holty missed the last one and Martin was down for the Queen of the South game and I put the instruction on for him to take it. He normally hits them well but he didn't hit it cleanly and it was a poor penalty. "We'll go back to work over the weekend and see if we can bring some players in as we are a little bit depleted at the minute." Match ends, Dundee United 1, Hibernian 0. Second Half ends, Dundee United 1, Hibernian 0. Substitution, Dundee United. Cameron Smith replaces Tony Andreu. Attempt missed. Tony Andreu (Dundee United) right footed shot from outside the box misses to the right. Attempt blocked. Charlie Telfer (Dundee United) right footed shot from outside the box is blocked. Foul by Andrew Shinnie (Hibernian). Substitution, Hibernian. Neal Eardley replaces Liam Fontaine. Stewart Murdoch (Dundee United) is shown the yellow card for a bad foul. Andrew Shinnie (Hibernian) wins a free kick in the attacking half. Attempt saved. Jason Cummings (Hibernian) left footed shot from outside the box is saved in the top centre of the goal. Willo Flood (Dundee United) wins a free kick in the defensive half. Substitution, Dundee United. Stewart Murdoch replaces Blair Spittal. Substitution, Hibernian. Brian Graham replaces Marvin Bartley. Lewis Toshney (Dundee United) is shown the yellow card for a bad foul. Attempt missed. Darren McGregor (Hibernian) right footed shot from outside the box misses to the right. Corner, Hibernian. Conceded by Willo Flood. Goal! Dundee United 1, Hibernian 0. Tony Andreu (Dundee United) converts the penalty with a right footed shot to the bottom right corner. Penalty conceded by Liam Fontaine (Hibernian) after a foul in the penalty area. Penalty Dundee United. Simon Murray draws a foul in the penalty area. Attempt missed. Paul Hanlon (Hibernian) header from the centre of the box misses to the left. Corner, Hibernian. Conceded by Blair Spittal. Substitution, Dundee United. Simon Murray replaces Nick van der Velden. Marvin Bartley (Hibernian) wins a free kick on the left wing. Corner, Hibernian. Conceded by Lewis Toshney. Substitution, Hibernian. Jason Cummings replaces Martin Boyle. David Gray (Hibernian) wins a free kick in the attacking half. Foul by Nick van der Velden (Dundee United). Paul Hanlon (Hibernian) wins a free kick in the defensive half.